From a family history perspective, exciting thing about the will, is that it bears Thomas Thrale's unique mark. When I first saw his mark1 I was astounded to see that his mark was nothing like the "x" mark commonly used by illiterate individuals, but instead was the mark of a Broad Arrow. This is an important discovery. It provides evidence of the Thrale Broad Arrow legend from during Queen Elizabeth I's lifetime. 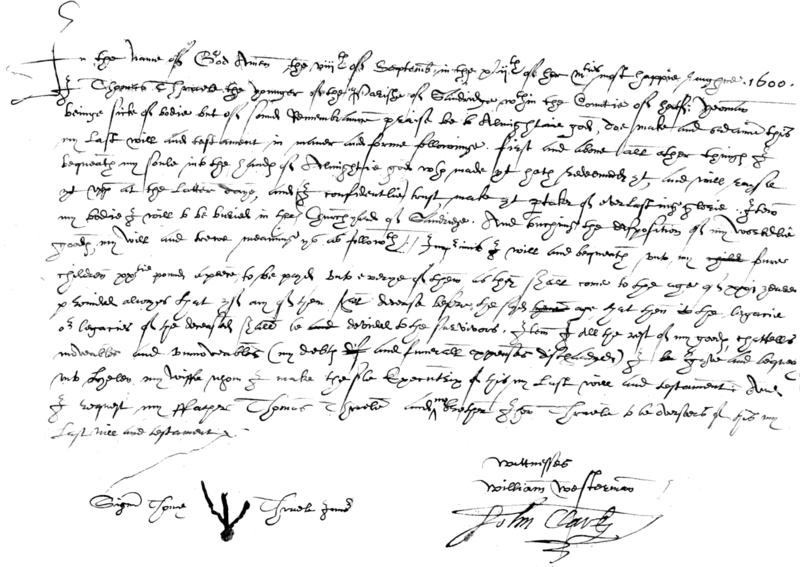 Queen Elizabeth I, did not die until 24 March 1603, almost three years after Thomas Thrale made his broad arrow mark on his will. All other previously known references to this family legend arrow did not occur until 280 years later in the late 19th century. This mark was made on 8 September 1600, about 40 years after Queen Elizabeth I's life was apparently saved and just 42 years or so since the Royal grant of the Broad Arrow was made to the Thrale family. 1 In the name of God Amen, the viiith of September, in the xliith of her Mtis2 most happie reighne 1600. 15 last will and testament. 4. Latin for first or foremost.